Within a labyrinth of subterranean stores, Taiwanese otaku find a home. Editor's note: CNNGo, part of CNN International, features local insights from Asia and Australia. Learn more about otaku interests around the world through our colleagues' on-the-scene reports of Asian culture. Surrounding Taipei Main Station is a maze of underground markets with stores selling a menagerie of cheap merchandise, from traditional Chinese clothing to fake cosmetics. But a little exploring reveals more than just the standard goods. Welcome to Taiwan's underground geek culture paradise. The shops are largely frequented by the growing population of immigrants coming from the Philippines, Indonesia and other Southeast Asian countries who are finding jobs as maids, construction workers and waiters or waitresses across the country. A nearby Catholic church attracts hundreds of Filipino immigrants who travel on Sundays to the station, which, in addition to subway access, has bus and train services. 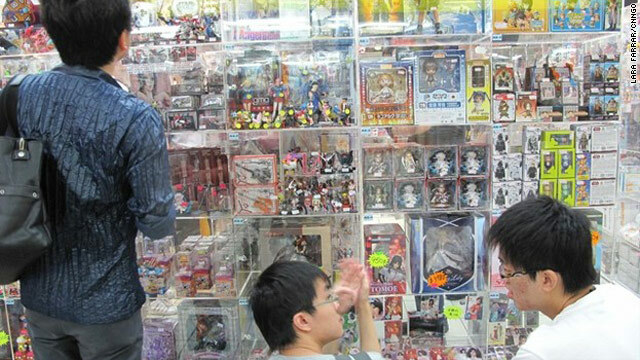 However, hidden amid the small stalls selling low-cost imports from the region is a strip of stores that has become infamous among a growing subculture of Taiwanese students and young adults obsessed with action figures, dolls, comic books, animations and video games, particularly from Japan. The subculture has become so pervasive on the island that it has garnered the name “otaku,” a Japanese term used to describe young people who have more than a mild infatuation with video games, anime and manga, or Japanese comics, according to the online portal eTaiwanNews.com. Aside from console and computer games, the shops also feature collectible action figures from popular Japanese anime and comic books, including giant plastic robots from the animated Gundam series and shiny mystical warriors from the Knights of the Zodiac manga collection. Fans can pre-order the toys from catalogs. And some stores have rows of clear, plastic shelves divided into cubicles that are rented by individual vendors who sell the figurines and other memorabilia from personal collections. For now, it appears Japan’s influence won’t fade in the short-term. Yet, as China’s gaming sector matures and expands abroad, the tastes of Taiwan’s otaku subculture could soon become more Chinese. Yeah, that's definitely a sanctuary for the tech enthusiast. Pretty awesome.